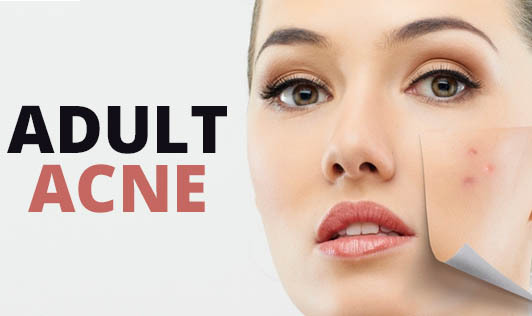 Adult acne can really crease one's life. This is caused by sebum, an oily substance produced by the skin's sebaceous glands. The sebum clogs pores that attract bacteria and become inflamed. For many adults, the breakouts are a result of hypersensitivity or overproduction of androgens (male hormones). An imbalance in female and male hormones can also cause breakouts. For many women, this can happen during pregnancy, menopause and perimenopause. Also, medications such as corticosteroids as well as cosmetics may also cause adult acne. If acne runs in one's family, the person is likely to have acne too. Which parts of the body are affected by acne? • Blackheads - small black or yellowish bumps that develop on the skin. • Whiteheads - they are firm and have a white centre. • Papules - small red bumps that may feel sore and tender. • Nodules - large lumps that build up beneath the surface of the skin and are painful. • Pustules - very similar to papules but usually have a white tip in the centre that is due to build up of pus. Acne scarring may develop as a complication of acne. It usually happens when the more serious types of spots burst and damage the nearby skin. Acne scarring may also occur if one tends to squeeze and pick the spots; hence it's important that you refrain from doing this. • Boxcar scars - oval or round depression, or craters in the skin. • Ice pick scars - tiny, deep holes in the surface of one's skin that has been punctured with a sharp object. • Rolling scars - This is caused by bands of scar tissue that form under the skin giving the surface of the skin, uneven and rolling appearance. It's very important for people with acne to keep their skin clean to prevent new spots from developing. Wash the affected area twice a day with a mild cleanser or soap, do not scrub too hard. If your acne is making you feel depressed and you're unable to control your spots with over the counter medication or creams, contact your doctor.